I think cauliflower is one of the most gorgeous vegetables. Bright white with some foliage left on makes it an eye catcher. I actually took one as a house warming gift (short notice of the party...I normally do better than one lonely head of cauliflower for a gift) and everyone was very taken by freshness and greenery. However that bright white color isn't with out a little effort....in the form of a pony tail. 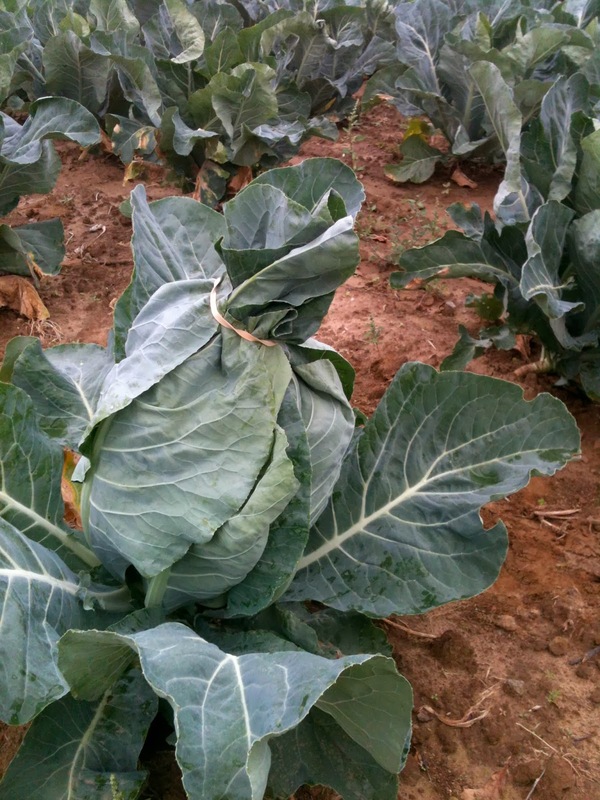 Tying cauliflower leaves is common practice. As soon as a head has formed, we gather the large leaves and tie with a rubber band. Not just any rubber band...a large colored rubber band. Since cauliflower will mature at different rates we go back in several times - using a different colored rubber band each time. I used tan for my first round so I knew that those heads would be ready first. ..second red and last green. Tying of the leaves also helps prevent frost damage. Last week when it was 28 degree at 8 P.M. made me a bit nervous. Very cold temperatures won't ruin the cauliflower but it'll make it a little brown on the top (freezer burn)....which makes it less appealing to purchase. In regards to knowing when they are large enough for harvest I was told by a very wise farmer, " Just reach you hand in there, between the leaves and if it feel like a 42 Double D...it's ready." I prefer eating cauliflower over broccoli that's for sure. My favorite way is just steamed. Roasting is also an A+ choice. 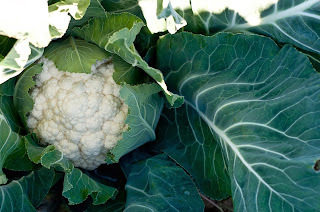 On my To Do List for tomorrow is to can those little snow white (or green, purple, or orange...in love with colored cauliflower!) florets. Nice post! Cauliflower is good for health, I eat it every day. I like very much Cauliflower Mashed Potatoes. I must try it for my family. CAULIFLOWER is one of my favorite vegetable.i often prepare home dishes with it.Thanks for writing on it. that is some nice healthy bio food there ! Looks really great ! Hi! Since cauliflower is very healthy food, I loved these recipes and will them a try for sure. Thanks for sharing! I love your story about harvesting the cauliflowers. 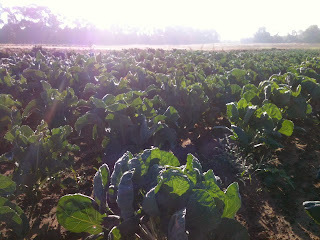 The cauliflowers look green and fresh. Healthy food. Looks really awesome! thanks for sharing it was helpful.